If you’ve recently been diving in St. Thomas, you may have stumbled upon some strange purple orbs and wondered if aliens deposited their giant eggs for incubation on our reefs. Or maybe you thought you had discovered a new species of algae ripe for naming after yourself (or maybe you thought had indigestion and were hallucinating). 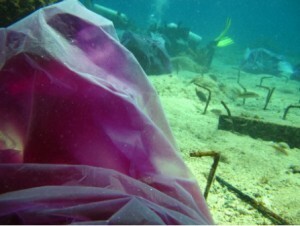 Actually, the Purple Bags of Fun, as dubbed by Dr. Marilyn Brandt of the University of the Virgin Islands (UVI), are an important part of the research project titled Towards modeling the trajectory of US Virgin Islands coral reefs – Scleractinian growth and recruitment rates along an onshore-offshore gradient. Funded by the Virgin Islands Experimental Program to Stimulate Competitive Research (VI-EPSCoR), Dr. Marilyn Brandt and Dr. Angela Dikou are quantifying the growth and recruitment rates of several reef-building corals in reefs exposed to different levels of human impacts. This information is lacking in the Caribbean and as human population expands, the need to understand human impacts on coral growth, and ultimately coral reef resilience, is particularly vital. “Purple Bags of Fun” – Plastic bags filled with cinder blocks attached with several coral nubbins. Alzarin red stain fills the volume of water inside the bag and will be absorbed into the corals’ skeleton in order to create a marker for measuring growth rate. To do this, a team consisting of Dr. Brandt, Dr. Dikou, and a group of helpful graduate students were permitted by the Department of Planning and Natural Resources to collect nubbins, or fragments, of particularly important Caribbean coral species from local reefs: Porites astreoides, Siderastrea siderea, Favia fragum, Porites porites, Montastrea annularis, and Agaricia agaricites. These nubbins were then attached with special cement to cinder blocks submerged at the different reefs. After time for acclimation was given to the coral nubbins, divers descended upon each site to envelop the nubbins with large, clear, plastic trash bags. Why the plastic bagging? For a dye job, of course; even corals want a little color in their roots. Graduate students Gabby Renchen and Rob Brewer working together to lift coral-covered cinder blocks into plastic bags before tying them shut and injecting the alizarin red stain. Background: Divers placing coral-covered cinder blocks into plastic bags in preparation for alizarin red stain injection at different reef sites in St. Thomas. Foreground: A post-injection coral-covered cinder block inside a plastic bag. These corals are left in the bag overnight to absorb the marker dye. All jokes aside, the corals were being marked, or banded, with a dye. After bagging, the divers used a hypodermic needle to inject a purplish dye called alizarin red stain through the bag and into the volume of water that surrounded the corals. 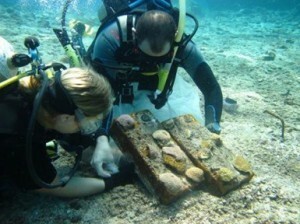 This is a careful process – not ripping the bags while manipulating them around cinder block and hard coral takes skill, especially while diving under the influence of current and other ocean elements. Checking for leaks, divers closed any accidental holes in the plastic with small pieces of wire and, after a few underwater high fives and fin taps, divers ascended. Diver injecting alizarin red stain into plastic bags. The needle penetrates the plastic bag and the dye plumes inside the water surrounding the corals. The bags were left in place throughout the sunlight of day to allow for the coral skeletons to absorb the dye via photosynthesis, a process we know on land as something that plants do to get energy from sun. In the ocean, coral animals rely on their zooxanthellae-algal symbionts (plant partners that live inside the coral) to absorb energy from the sun. Because the sun is needed for the absorption process, using clear bags that allow sunlight to penetrate to the corals was an important detail anticipated by Dr. Dikou and Dr. Brandt’s team, and the researchers that created this methodology (Barnes 1970). 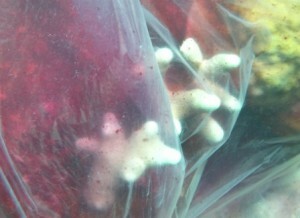 A close up look at P. porites inside the clear plastic bag as the alizarin red dye spreads. 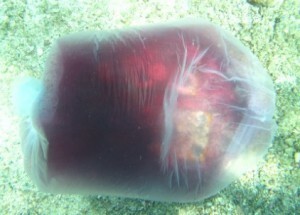 Transparency of the plastic bag is important because it allows for sunlight to penetrate through to the photosynthetic algae-zooxanthellae that live in the coral animal. Photosynthesis is the mechanism by which the coral will absorb the red stain and, in turn, mark the skeleton so that the researchers can later measure growth rate. The following day, the divers returned to their sites and removed the plastic bags. A reddish-purple band will be incorporated into the corals’ respective skeletons and this band will be a reference point for growth. After six months, the team will repeat the injection process to create another marker within the coral. The distance between the bands divided by the time between dye jobs will provide the researchers with growth rates that can be compared among sites. This information, coupled with existing water quality, coral community composition, and coral reef health data, will ultimately be inputs for predictive modelling of Caribbean reefs over time. Even with today’s technology, the underwater world remains mysterious. You never know what you could encounter while diving or snorkeling, a thrill that keeps most people coming back for more. As scientists like those working at UVI continue to study nature, we become more capable of applying our knowledge to conserve the natural resources we rely on.